An app’s compatibility with Dark Mode is determined by a combination of the SDK it was built against, and the value of the “NSRequiresAquaSystemAppearance” Info.plist key. If your app is built against the 10.14 SDK or later, it will be considered compatible unless the key is set to YES. If your app is built against the 10.13 SDK or earlier, it is considered incompatible unless the Info.plist key is set to NO. When a compatible app is launched, its appearance is set to match the user’s system-wide preference, as selected in the System Preferences “General” tab. To streamline development, Apple also provides a switch in Xcode itself so that the appearance of a running app can be switched on the fly without affecting the appearance of other apps running on your Mac. This arrangement will allow you to run Xcode and other apps in Light Aqua while debugging your own app in Dark Mode. Check out the next article in this series: Checking Appearances. It goes without saying that every Mac developer should watch What’s New in Cocoa for macOS. This is always a great overview that touches on the major changes to follow up on in other sessions. For Dark Mode in particular, be sure to watch both the Introducing Dark Mode and Advanced Dark Mode sessions. These include a lot of excellent advice about both high-level design considerations and low-level practical uses of the NSAppearance API. Apart from the reference documentation on NSAppearance, be sure to read the longer-form Supporting Dark Mode in Your Interface, and Providing Images for Different Appearances. These high-level guides will orient you to the types of work you will likely need to do in your app. Finally, the macOS 10.14 Release Notes include a number of details about Dark Mode, and particularly about special background blending modes and how they affect the user interface of an application. Although dark interfaces are nothing new, Apple’s official take on it with macOS Mojave establishes specific aesthetic choices. You’ll want to become acquainted with the decisions Apple has made so you can make the right call in your own app. I recommend switching your macOS Mojave Mac to Dark Mode and running as many apps as possible in Dark Mode to get a sense for the prevailing aesthetics. The vast majority of Apple’s own apps have been tastefully adapted, and a growing number of 3rd party titles are listed on the Mac App Store as Apps That Look Great in Dark Mode. I’m honored that one of my own apps, MarsEdit, is listed there. Check out the next article in this series: Opting In. I spent a good part of the summer learning about macOS Mojave’s new Dark Mode theme, and how Mac apps can support the theme both in technical and practical ways. I adapted MarsEdit, Black Ink, FlexTime, and FastScripts to the new interface style. During that process, I learned a lot about where to look for advice, and how to handle common scenarios. I’d like to share that advice with folks who have yet to undertake this work. The gist of what I have to share comes from tackling challenge after challenge in my own apps. Some interfaces adapted effortlessly to Dark Mode, some needed only a little finessing, while others demanded relatively hard-core infrastructural changes. My advice will focus on the dichotomy of Light Mode and Dark Mode. The Mac’s appearance support is more nuanced than that. NSAppearance supports a hierarchy of appearances that build upon one another. The light and dark modes are the two most prominent user-facing examples, but variations such as high contrast modes should also be considered. Got more money than time? Consider hiring me on a short-term basis specifically to help your company adapt existing apps to Dark Mode. Drop me a line if interested. In the What’s New in Cocoa for macOS session at WWDC 2018, Apple announced Quick Actions, which are handy little contextual tasks you can invoke on selected items in the Finder, either from a contextual menu or from the Preview side panel. The emphasis in the session was on creating Quick Actions via Automator. There, it’s as simple as creating a new workflow document, selecting “Quick Action” from the template palette, and saving. It even puts it in the right place (~/Library/Services). Essentially, Quick Actions appear to be macOS Services, which have a long history and which Automator has previously been able to create. In fact in macOS Mojave betas, the Quick Action document seems to completely supersede the “Service” type. But what about native applications that want to provide Quick Actions? I didn’t see anything in the WWDC session to address this scenario, so I started poking around myself. When you click the “More…” button in Finder’s Preview panel, it opens up System Preferences’s Extensions settings, focused on a special “Finder” section. In the list are several built-in extensions. I thought these were likely to be implemented as binary app extensions, so I instinctively control-clicked on one. A “Reveal in Finder” option appeared, so I selected it. Sure enough, they live inside Finder itself, and are packaged as “.appex” bundles, the same format that Apple supports for 3rd-party applications. What’s handy about finding an example of an app extension you want to emulate, is you can open up its bundle and examine the Info.plist. Apple’s approach to identifying app extensions’s capabilities and appearance is based heavily on the specification of values in an NSExtension entry. Looking at one of Apples models, I saw confirmation that at least this variant was of type “com.apple.services” and that its attributes included many useful values. NSExtensionActivationRule, are substantially documented, and can be used to finely tune which types of target items an extension can perform useful actions on. Others, such as NSExtensionServiceAllowsFinderPreviewItem and NSExtensionServiceFinderPreviewIconName do not appear to be publicly documented yet, but one can guess at what their meaning is. I’m not sure yet if the icon name has to be something public or if you can bundle a custom icon and reference it from the extension. I was alerted on Twitter to at least one other key: NSExtensionServiceAllowsTouchBarItem, which evidently triggers the action’s appearance in the Touch Bar while a qualified item is selected. Of course, until these are documented, and even when they are, until macOS Mojave 10.14 ships, you should consider these all to be preliminary values which could disappear depending on further development by Apple of the upcoming OS. 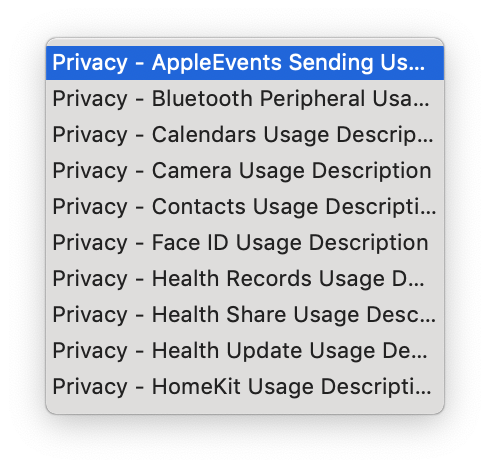 In case you haven’t heard, macOS Mojave is bringing a new “Apple Events sandbox” that will affect the behavior of apps that send Apple Events to other apps either directly, or by way of running an AppleScript. I wrote more about this on my non-development blog, Bitsplitting: Reauthorizing Automation in Mojave. Typically, the system is simply supposed to ask users whether they approve of the Apple Events being sent from one app to another, but in some instances it seems the events are rejected without ever prompting the user. My friend Paul Kim of Hazel fame asked in a developer chat room whether any of us were having this kind of trouble specifically with apps built in Xcode 10, against the macOS 10.14 SDK. This rang a bell for me on two levels: first, I had seen a similar behavior with FastScripts, which I eventually fixed by switching it to a much newer build system, and dropping support for versions of macOS older than 10.12. It was the right time for me to make those changes, so I didn’t mind doing it, but I never quite understood why the behavior was happening. I’m not sure if requiring the usage description string is intentional or not, but it’s probably a good idea even if, as in the case of FastScripts, you have to be pretty vague about what the specific usage is. I don’t think this usage string was covered in the WWDC 2018 session about macOS security. Hopefully if you’ve run into this with your Mac app, this post will help you to work around the problem. FastScripts [...] is calling TIS/TSM in non-main thread environment, ERROR : This is NOT allowed. Please call TIS/TSM in main thread!!! Ruh-roh, that doesn’t sound good. Particularly with the emphasis of three, count them three, exclamation points! I better figure out what’s going on here. But how? 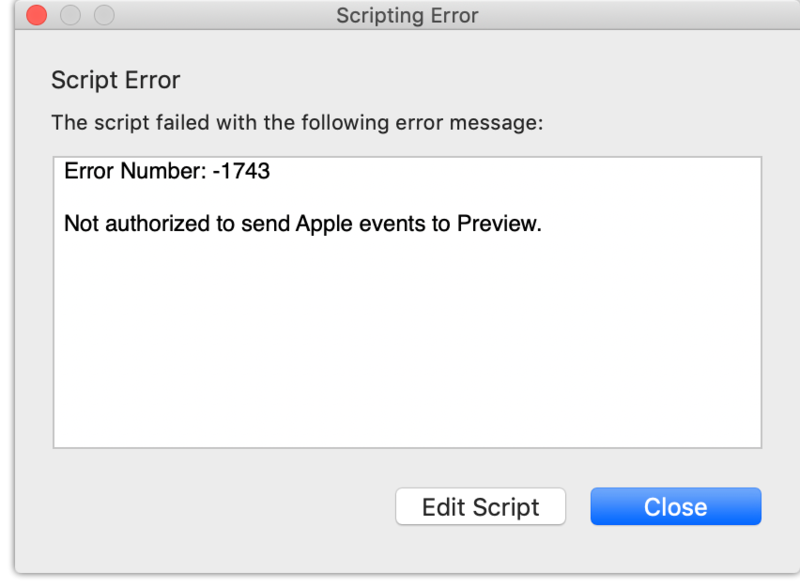 default	11:54:18.482226 -0400	com.apple.WebKit.WebContent	Set a breakpoint at SLSLogBreak to catch errors/faults as they are logged. This particular warning doesn’t seem to apply to my app, but if it did, I would have something good to go on if I wanted to learn more. With the TIS/TSM warning, however, I have no idea where to go. Do I even use TIS/TSM? What is TSM? I’ve worked on Apple platforms for long enough to know that TSM stands for Text Services Manager. However, I have also worked on these platforms long enough to forget whether I’ve actually used, or am still using, such a framework in my apps! When these kinds of warnings appear in the console, as many times as not they reflect imperfections in Apple’s own framework code. Is it something Apple’s doing, or something I’m doing, that’s triggering this message? Ideally we could set a breakpoint on the very line of code that causes this console message to be printed. This can be surprisingly difficult though. There have always been a variety of logging mechanisms. Should you set the breakpoint on NSLog, os_log, printf, fprintf, or write? I could probably figure out a comprehensive method for catching anything that might write to the console, but am I even sure this console method is being generated in my app’s main process? There are a lot of variables here. (Hah! In this particular case, I ended up digging deeper and discovering it calls “CFLog”). Command #2 'c' continued the target. 2018-08-14 12:15:40.326538-0400 FastScripts[16022:624168] pid(16022)/euid(501) is calling TIS/TSM in non-main thread environment, ERROR : This is NOT allowed. Please call TIS/TSM in main thread!!! But I’m proud, because I tracked down the root of the problem pretty efficiently using lldb’s fantastic breakpoint commands. Next time you’re at a loss for how or where something could possibly be happening, consider the possibility of setting a broad, regular expression based breakpoint, and a series of commands to help clarify what’s happening when those breakpoints are hit. Then? Let it rip! Instead of the expected method, Xcode has twisted itself into knots to contrive that letters from the whole prototype for “addObserver” can be used to spell out “canBecome”. Not particularly useful. In my not so very humble at all opinion, Xcode should go the extra mile here and look for matches in the “var” realm when you’ve type “func”, and vice-versa. If it finds something that perfectly matches everything you’ve typed except whether it’s a func or a var, then it should offer the completion and fix the mistyped designation when you accept it. I’ve filed Radar #42660012 requesting this enhancement. Update: Several folks have suggested a good workaround: simply get in the habit of omitting the decorative terms, such as “override”, “func”, and “var”. It turns out if you leave out the narrowing term, Xcode does find the pertinent matches, and also inserts the required decoration upon inserting one. My friend Chris Liscio pointed out that changing the behavior as I recommend might be a questionable move, because it defies a kind of rule for type-completion. In general, whatever the user has already typed should be considered what the user knows they want, and completion should only offer pertinent matches. It’s a compelling argument but I think that in cases like this the computer actually knows more about what I really want than I do. There’s a general consensus among many Mac and (mostly) iOS developers, that AppKit is “old and busted” and UIKit is “new and refined.” I am still fairly limited in my experience with UIKit, but in many ways I agree that in developing the framework, they left some of the more annoying baggage of AppKit behind. However, they also left off many conveniences that AppKit developers like myself have come to rely upon. On UIKit, as far as I can tell, it takes a bit more work. There is no UIWorkspace, which is probably fine, but there is also no UIImage.iconForFile, or similar method to make this quite as straightforward as it is on the Mac. It would be fairly easy to further extend this to support creating icon images from MIME types. Hope this helps some of you folks, especially coming from the Mac, who expected getting icons for file types to be slightly easier than it is. Since I haven’t marked my typealiases as ‘public’, they won’t be exported to clients, but the above will also fail to compile. Swift requires that public methods work only with public types. This makes sense, because if the types aren’t public, how are clients expected to be able to work with them? But if I mark the typealiases public, I impose a new type “RSPlatformNativeImage” on clients, when as far as they are concerned, this method operates on either an NSImage or UIImage. They might quickly get the idea that RSPlatformNativeImage is just a typealias, but it’s a bit of unwanted clutter on the public-facing API. Thus for Objective-C clients the clutter of the typelias definition is tidied away, but for Swift clients, it must still be dealt with. I filed a bug requesting this behavior in the Swift bug tracking system. Recently, as a consequence of working with the CGImageSource API, I found myself in a situation where I had hold of a CFNumber and wanted to get its value, as a CGFloat, in Swift. You can use methods like initializeMemory(as:from:) and moveInitializeMemory(as:from:count:) to bind raw memory to a type and initialize it with a value or series of values. Alas, same problem. Surely somebody has figured this out? I try Googling for “CFNumberGetValue Swift GitHub” and find a promising result from an authoritative source. The Swift standard library itself!